To help your tomatoes ripen before the weather turns, simply hang a couple of bananas next to your green crop. They’ll release a gas called ethylene that will encourage your tomatoes to ripen up. The best way to keep on top of those pesky weeds. Learn about plug plants and how to give them the best start in life. Discover the right way to repot and look after your house plants this spring. 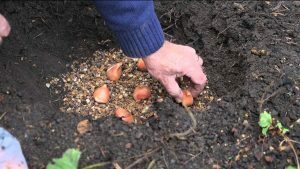 Learn how to sow hardy annuals, starting with the preperation of the soil. 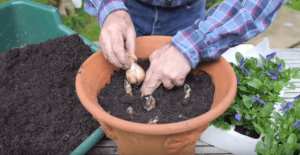 Richard shows you how to grow your own delicious potatoes! Geoff’s top tips for protecting your container plants from the cold this winter. Learn how and when to plant container-grown shrubs in your garden with our easy to follow guide. How to check, prepare and store Begonia tubers for the winter, so they’re ready to start growing again next spring. How to force your indoor bulbs to ensure they’re flowering in time for Christmas. Keep the colour in your garden this winter with our how-to guide on planting your autumn to spring bedding. Rejuvenate your herbaceous perennials. A step by step guide to dividing established perennials and planting on. 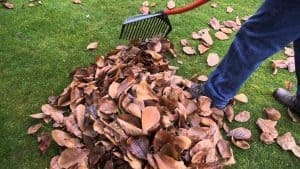 Here’s a great way to use up all those autumn leaves falling in your garden and turn them into a wonderful, nutrient rich leaf compost. Find out how to keep your pots healthy over the rainy autumn and cold winter months. November’s the best time to plant up your Tulips, here Richard shows you how to achieve a stunning display in your borders or pots. Use grass seed to fix any patches in your lawn, you should see the difference in just a few weeks. How often should you water your plants? Our watering guide explains all and demostrates a few tips and techniques. Geoff shares his tips to help keep your summer bedding plants blooming longer. Keep your climbers looking their best with a little support and regular tying in. Richard shows you how to grow your own delicious potatoes in a grow bag. Collect seeds from your favourite flowers so you can grow them again for free next year! Make sure you get the very most out of your Sweet Peas using these tips from Richard. Fill out any gaps in the garden by sowing late cropping salad and vegetable seeds. Geoff shows how to make the most of your herbaceous perennials once they’ve finished flowering. Top tips for looking after the UK’s favourite flowering houseplant to keep them in great condition. Looking to achieve an amazing display of colour? We show you how to plant out your summer bedding plants. Keep your wonderful Roses in top condition with these easy tips. A few techniques on how to save time when watering your garden. These quick jobs will help you maintain your garden even when you’re off on holiday! Take cuttings from established plants and grow them on to increase your stock of them for free! Use frames to support taller growing plants and stop them drooping under their own weight. Richard explains the best time to pick your delicious, home-grown herbs. Use scrunched-up newspaper to help stop your compost from going stale and stodgy! Richard shows you how to get the very best out of your Clematis. Geoff Hodge explains the difference between different types of fertiliser and the benefits of using each. The right way to prune your flowering shrubs to ensure the best display the following year. 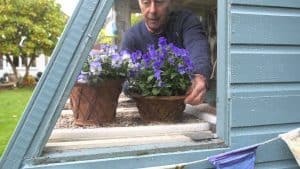 Geoff shows you the easy way to create your hanging baskets. Keep your clematis look it’s best! These vigorous plants are fantastic but can soon become out of control. Insect pests? Go on pest patrol! Keep your bird-feeders topped up over the Spring and Summer. 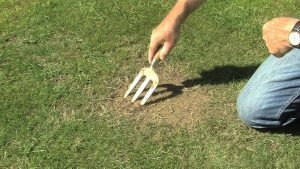 How to rescue patches in your lawn and restore them to their very best! Get rid of dead flower heads on your Daffodils to give them a real boost! 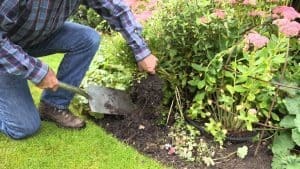 Give straggly looking plants a real cut back to help boost regrowth over the Spring and Summer. Richard gives you a hand on how to get rid of Lily Beetle. Keep your lawn looking lush and green by giving it a feed with Lawn Magic! 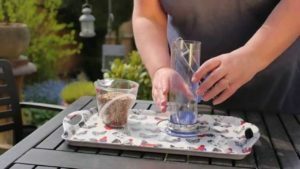 Richard shows you the best way to grow herbs if you’re struggling to find space for multiple pots. Another quick tip on how to refresh a slightly tired looking patio with a few choice Pot Plants. 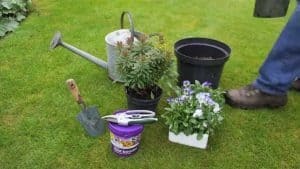 Richard shows you how to give your plants a new lease of life with a quick application of fresh compost and fertiliser.